This manual aims at the main performance characteristic, operation notice. The Figures are only for the reference. The products are based on the real presses. JH21-80Ton (800kN) Open back fixed bed punch press, adopting longitudinal crankshaft and taking crankshaft rod construction as the working mechanism. 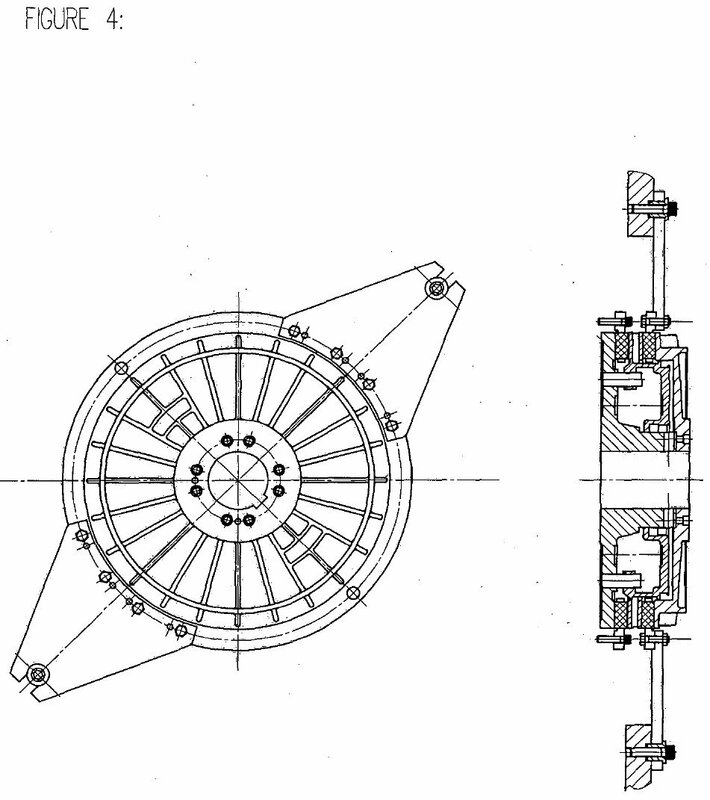 By the two-stage speed reduction of motor, the crankshaft will rotate, then the crankshaft connection rod will drive the slide to do reciprocating motion. The driving system is closed completely. The press adopts pneumatic clutch and brake, which makes the punch press work stably and the slide be stopped at any position. 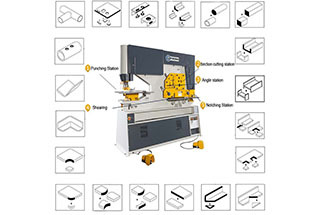 It is the universal press for sheet punching and pressing, and suitable for cutting, punching, blanking, bend, drawing, stretching but except for coining. The nominal pressure of the press is 800kN. The normal pressure stroke is 4.5mm. 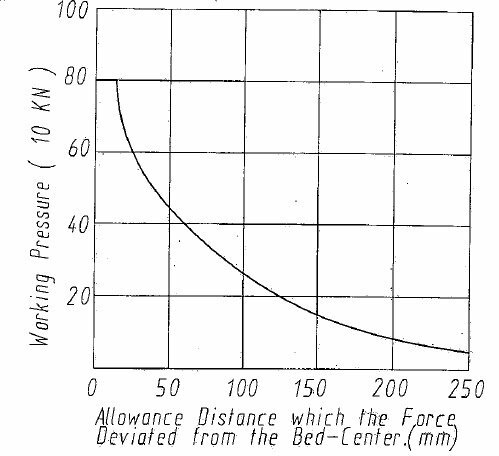 User should choose the pressure force according to the following graph. 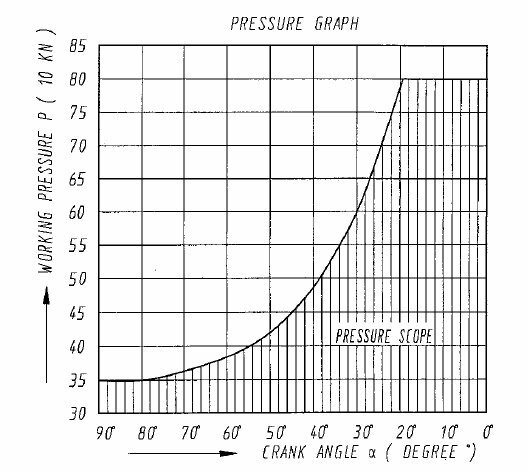 In operation, the crossing of working pressure and its angle of crank must not exceed the range indicated by the pressure curve. Otherwise it will harm the press. In order to make the press work normally, reduce the frequency of maintenance and assure the service life, it cannot be used in the environment of wet, aggressive gas, liquid and explosive gas. The air pressure cannot be less than 0.6 MPa. The voltage is 380±38V and the frequency is 50±5Hz. 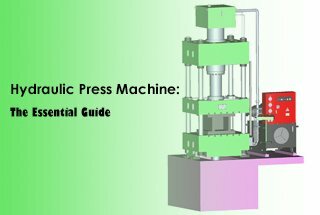 In order to make the punch press work in the best status, the user should use the press properly and calculate and refer to the following items before operate the press. The working load should be limited under the nominal pressure strictly. 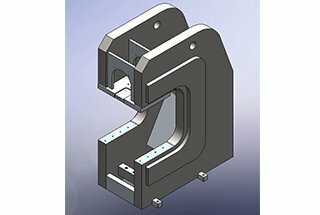 The overloading protector prevents overloading caused by mis-punching or sheet of non-uniform thickness in the process. It is wrong to use press with random overloading and easy to damage presses. So it is very important to calculate the working load before working. The punching force will be changed with the change of slide position. You should use the press according to the stroke pressure graph which shows this change. Stick will happen if the working pressure exceeds the rated torque. Besides that, the punch press machine will be stuck if applying load before clutch engaged. This phenomenon will do harm to the clutch. So, you must stop the punch press machine before in the course of processing immediately if it happens and take measures to prevent happening next time. In principle, it must be avoiding the eccentric load that will cause non-parallel between the lower surface of slide and the bolster, and uneven force to slide gib which will infect the precision. If not, please do it according to the figure of allowable distance that the load center deviates from the bolster to assure the precision and safety. 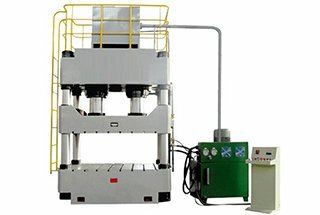 In order to make the punch press work in the best status and assure the service life of the clutch and brake, please work according to single turn on time listed in the main specification of the press. It will cause the abnormal wear of the clutch and brake and failure if exceed the single turn-on time. The single turn-on time of this press is not more than 25/minute. The welded frame adopts high-strength steel. The slide moves to and fro inside the gibs. 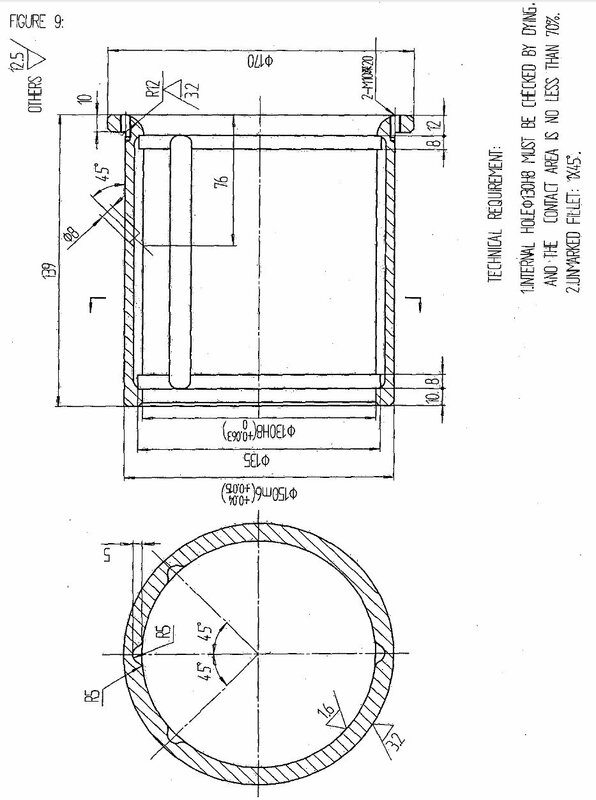 The screw of right side frame is used for adjusting the clearance of gibs and slide. The adjustment of knockout rod will make punched parts to be pushed down when the slide approaches the top dead center. But, if should care not to make the stripper touches the bottom of slide knockout rod groove to avoiding the accident. The bolster of frame is the basic measurement of the precision. It should maintain the surface roughness and flatness for avoiding the smash, hit and scratch of tools and cutting tools. The main motor drives the flywheel by the V belt and makes the energy be saved in the flywheel then transmitted to gear shaft by the friction clutch and brake. The gear shaft will drive the big gear dipped in oil bath, then the big rear will drive the crankshaft to make slide move up and down. V Belt adjustment: First unscrew 4 locknuts, then turn equally 4 adjusting screws. When replace the V belts, first unscrew the adjusting screws, loosen the belt, uninstall. the clutch brackets, and pull out the belt. It is very necessary to change all belts to new ones. Using new and old ones simultaneously will cause the service life reduction of belt for different tension. These old V belts Gan cooperate with other old ones. In addition, it is noticeable that belts of same nominal dimension maybe have length variance of several centimeters. So, the belts of same group should.be same length. The slide is one of the key parts of presses. Its precision directly influences the precision of presses. 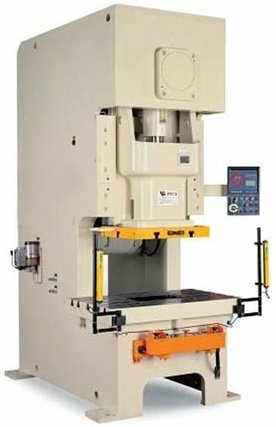 This punch press adopts square hexagonal long gibs which can attain good precision and stability. 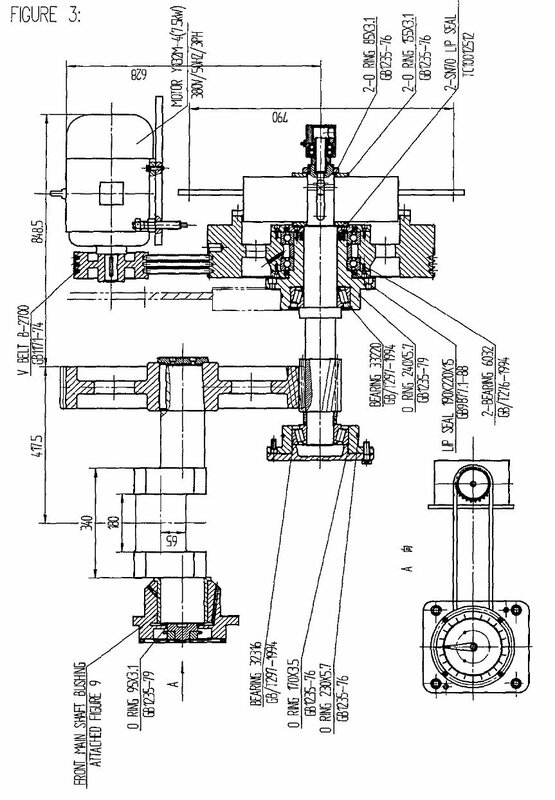 Connection rod and ball-head screw are components that change the rotation motion to reciprocating motion. The lower end of ball-head screw touches the ball-seat There is the hydraulic overload protector under the ball-seat. The protector could exhaust the oil in the hydraulic die cushion in about 1/100 second, then at the same time send out electric signal and make the press stop emergent for assuring the safety of die and press. 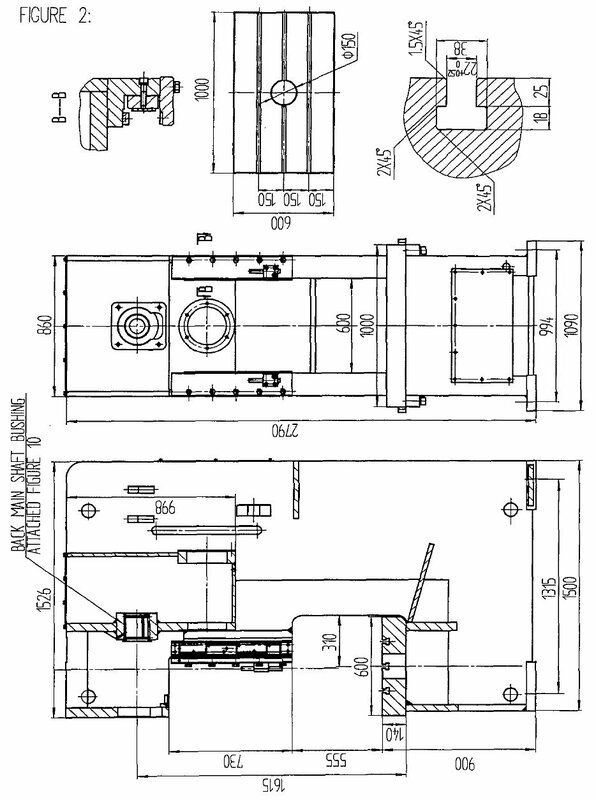 After the failure is eliminated and the slide moves back to top dead center, the hydraulic die cushion will rebuild the pressure automatically. Then the punch press could go on working. User can adjust the die height. 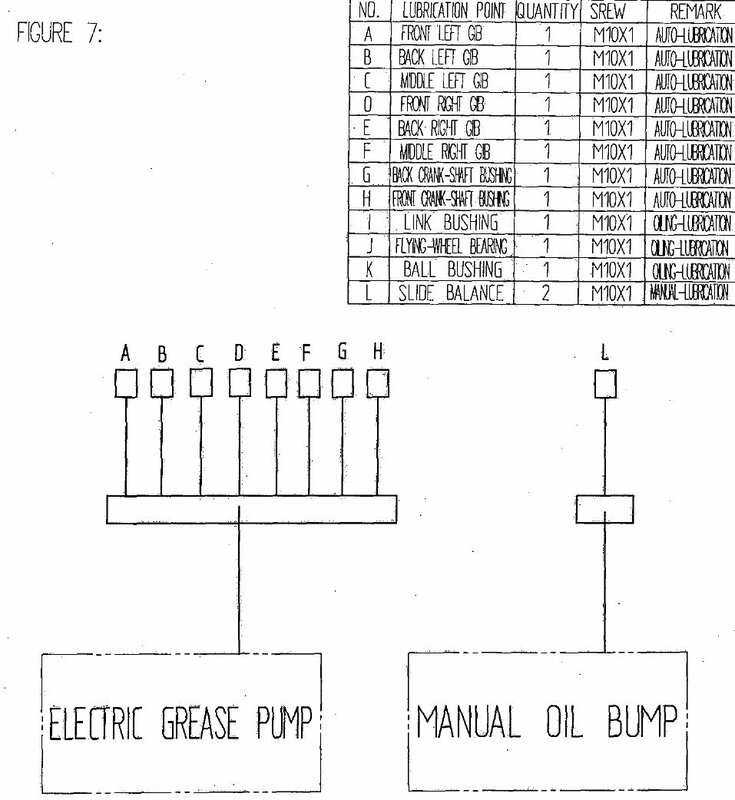 Please refer to relative operation of electrical parts of service manual. The distance between slide and gibs must be appropriate. It will make slide run smoothly and reliably. If necessary, it should be adjusted properly with the following procedure. (1) Loose the screws on the gibs and loose the set screws on the right side of frame. (2) Adjust the left side gibs and tighten the screw. (3) Adjust the right side gibs, choose the shims according to the clearance for the decision of taking out or increasing. After adjustment, tighten the front screws and right-side set screws. (4) The clearance between slide and gibs should be 0.03-0.05mm, but the total allowable value of front and back contact surface clearance should be 0.04-0.0Bmm. Usually the clearance between upper and lower ends is large. When depth of the thickness gauge is above 30mm, the measured value is right. (5) When all is adjusted, check the clearance of every part. If not right, re-adjust it. The knockout force is of 5% of nominal pressure. (1) Be combined of knockout rod, knockout seat and knockout bar. (2) Knockout bar is set above central line of slide, which crosses slide. (3) When the slide rises, knockout bar touches knockout rod, which ejects out the punched parts. (1) Unscrew fix screw of knockout rod, and adjust knockout rod to proper position. It is noticed that knockout rods of left and right sides should be with same height. (2) After adjustment, retighten fixed screws. (3) When using knockout bar, the touch of transverse bar and slide will cause noise. When user changes the die, it should be noticed that before adjusting the height of slide, raise knockout rod to the highest position to prevent striking knockout rod when adjusting die height. Adjust the position of knockout bar, which could make material being pushed when slide moves close to top dead center. But don’t let knockout bar touches the bottom of knockout slot for fear of accident. The counter installed in the electric panel is used to calculate and display cumulative number of strokes. When the slide moves up-and-sown once, the counter will take count of 1. lf it need be reset, press the reset button. 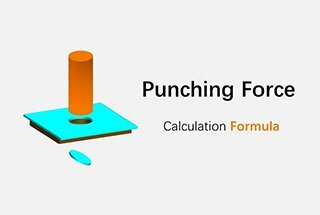 The counter can calculate the production output. (1) Push the switch to OFF, the counter will not work. (2) Push the switch to ON, the counter will work. When reset the counter, it must stop the slide in the top dead center. If reset the counter when the punch press is still working, it is possible to damage the counter. The hydraulic overload protector could auto=detect the oil pressure of oil hydraulic cylinder in the slide. When the oil pressure is not enough, it could supply the pressure quickly to maintain the normal work ability. When the overload caused by mis-punching and uneven thickness of sheet in the process happens, the protector can unload immediately to protect the service life of accessories and die. The hydraulic overload protector consisted of pressurized cylinder, pressure relieve valve and inductive switch. Check the oil level and check if there is enough oil in the air pump. If oil is not enough, loose the screw of pouring orfice and charge antioxidant pickling hydraulic oil (ISO VG-32) or other hydraulic oil of same performance. Make sure of air gage is normal. If the slide stops at the top dead center, press the reset button, then air operated pump will start working. About 1 minute, oil pressure will reach the specified value, air pump will stop. ① Push operation mode to “INCH” stroke. ③ When the slide arrives at top dead center, press the reset button, the air pump of overload protector will start working. about 1 minute, the pressure will reach specified value and the air pump will stop automatically, and overload indicator light will go out simultaneously. ④ The single and continuous operation modes can be used when the overload indicator light go out. ⑤ Operation preparation is complete. If there is air in oil pressure cushion, the function of hydraulic overload protector will not work well and make the air pump work ceaselessly. ① Stop the slide at the top dead center. ② For the safety, stop the main motor. After the flywheel stop completely, reverse the screw of oil drainage hole on the hydraulic overload protector with hexagonal spanner and the oil will flow out. ③ If the oil flowing out brokenly or with bubbles, it shows there is air interfused. When the oil doesn’t flow out brokenly or without bubbles any more, tighten the screw of oil drainage hole. Check whether there is gas leaking from the joint between the pump and end plane of oil box and if the oil pipe blow. ④ Air elimination is complete. If the punch press overloads, the overload indicator will light. (1) Periodically check whether there is gas leakage from the tube connecting to the safety valve. (2) Periodically clean the oil filter. (3) Periodically check whether bolts of connecting part are loose. (4) Periodically check the oil in the box is enough or not. (5) Periodically check the electromagnetic valve is normal or not. Solenoid valve is the main executing component and has the self-control function. When one valve could not work normally, the other valve will exhaust and make the clutch disengage, the slide will stop working to make sure of the safety of people and press. The pressure of air source should range from 0.55 to 0.6MPa. And it should notice to adjust the pressure to the specified value; the lubricator should maintain a certain oil level. The gas filter and air reservoir should often drain water and contamination. JH21-80 clutch air consumption: 0.18m3/min. It is suggested to select 0.3m3/min compressor for the single press. 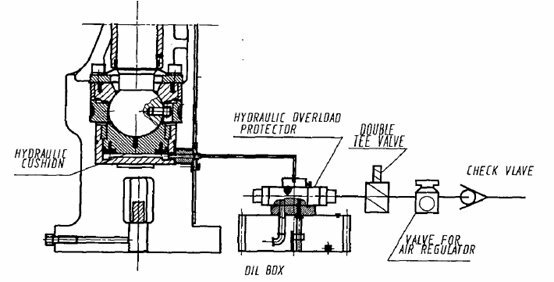 (1) When adding oil to the lubricator, the air pressure in the pipe line must be released to avoid the accident. 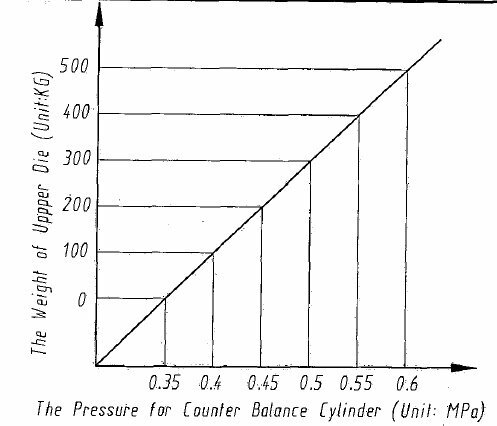 (2) The pressure of counterbalance cylinder and weight of upper die could be adjusted according to the following figure. The maximal allowable working pressure of counterbalance cylinder is 0.8MPa. (3) The electric relay iriterlQcks with the electric circuit. When the pressure is too low, the circuit will not work. The pressure relay has been adjusted before leaving factory; users should not adjust it at randomly. 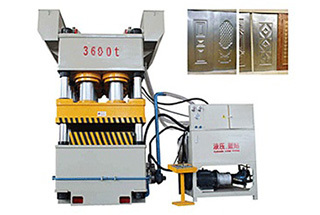 The punch press machine adopts intermittent auto lubrication system and manual oiling lubrication. 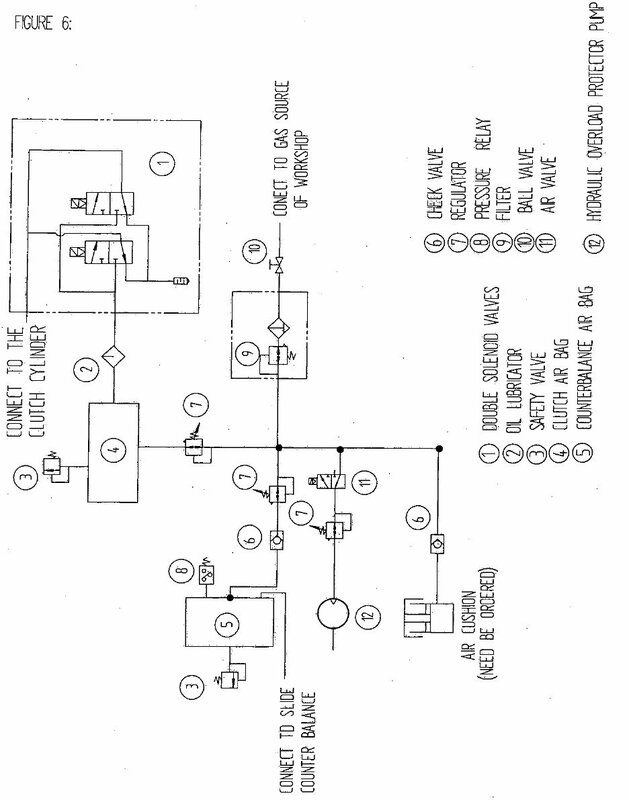 The oil is pumped to all lubrication points through the oil promoting distributor. The flywheel rolling bearing, rotating joint and air cushion are lubricated by oil gun. 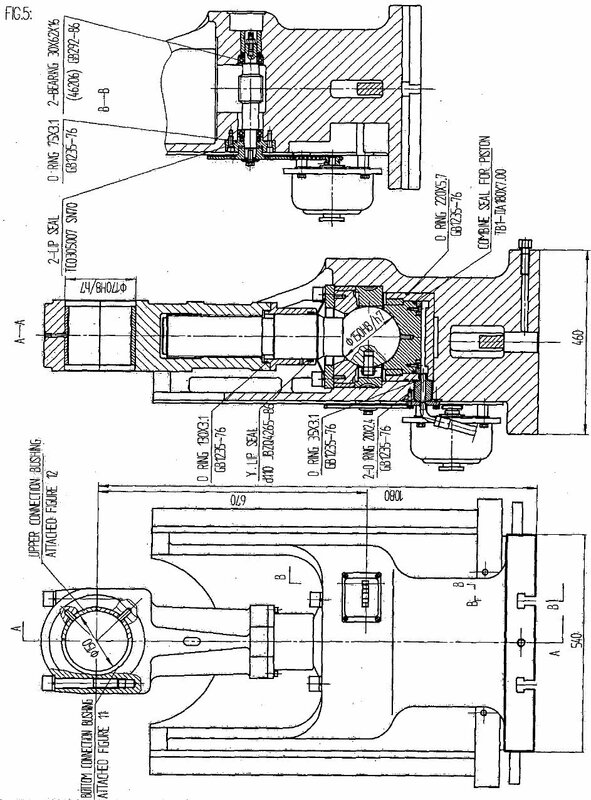 The lubrication system is very important to the crankshaft press. Through the lubrication, it can reduce wearing of accessories, increase the service life, assure the precision, and reduce the power consumption and maintenance fee. So except the friction surface of friction clutch anti brake, ·all parts in relative motion must be lubricated. 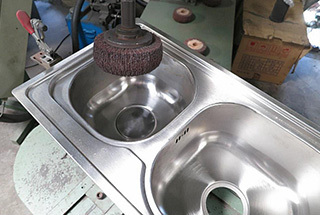 ① When operating the press, it should notice the lubrication effect to prevent the oil way jamming. Prevent the main bush, connecting rod bearing and slide gibs being heated and burned. The temperature should not be over +70°C and rising, temperature Should not be over <+-35°C. It should stop the punch press machine once heating. the temperature of main motor can not be over +60°C (Measure the cover of the motor). It should replace the lubrication oil for the first time after 3 months (about 750 hours) use. After that, it should replace the lubrication oil for once every 6 months and clean the gear case every 6 months (about 1500 hours). ③ The lubrication of the flywheel bearing and driving shaft bearing is enclosed type, fill the grease before assembling. It should fill the lubricating grease for once (3# lithium grease) every 2 months, and check for once every half year. When fill the grease to bearing, fill about 60-70% between flywheel and bearing. ④ The counterbalance cylinder adopts lubricated air lubrication and oil hand gun lubrication. ⑤ In order to assure the lubrication of ball screw and ball seat, it should add 100ml 20# oil before testing after the installation. 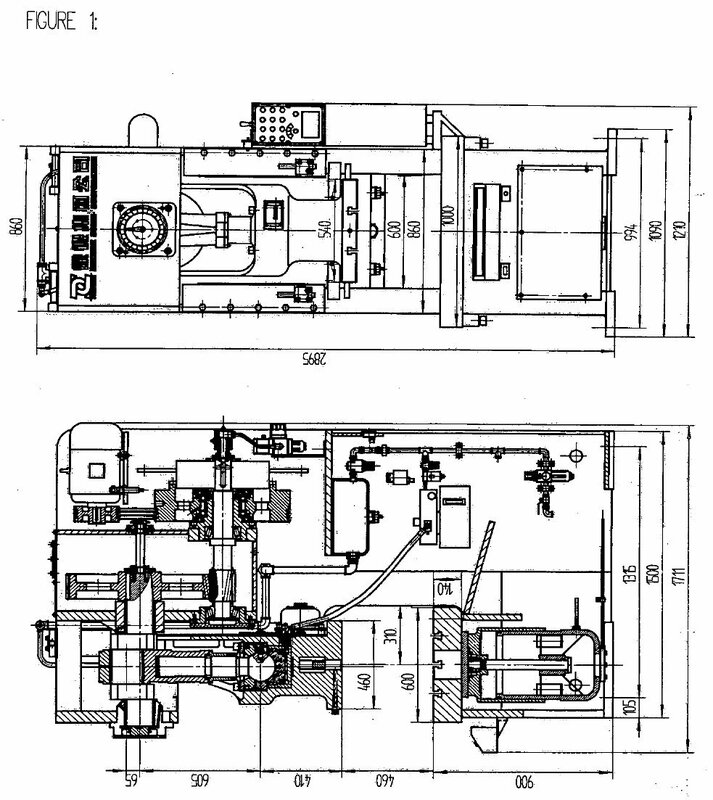 Lubrication and oil changing should refer to the lubrication direction on the press. First, start the main motor, the lubrication pump will work and operate the press after 5 minutes. 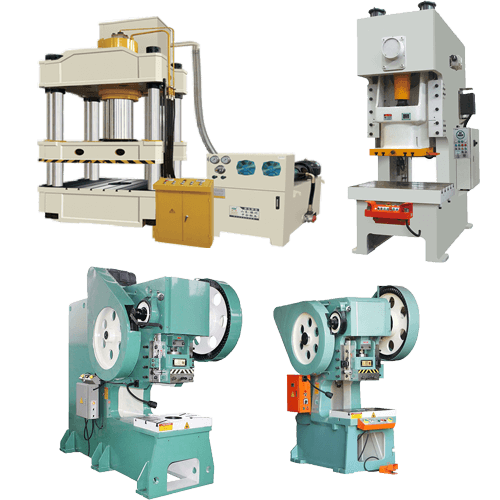 The punch press machine should go into production after the main motor running for 10 minutes when the press stops working for 24 hours. Check the lubricating oil box every day and fill the oil according to the need. During the initial installation period, the requirement of oil is large and it should fill the oil in time. It must cut off the power when manual oiling. It should fully clean the interior of oil box and tube when change oil. 1.1 Dig according to the foundation plan. 1.3 Lay the rubbles on the bottom to the height between 100mm and 200mm. 1.4 Preserve the holes in the base when filling concrete. 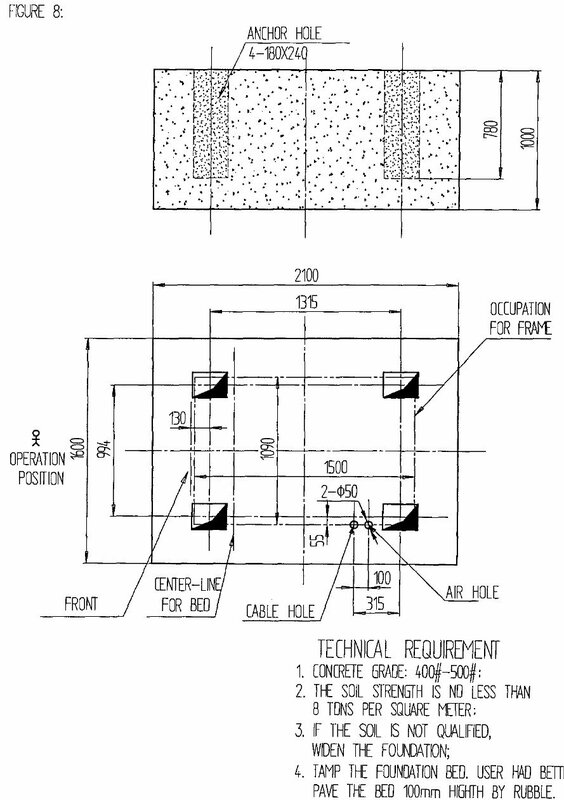 Prepare the concrete according to foundation plan. 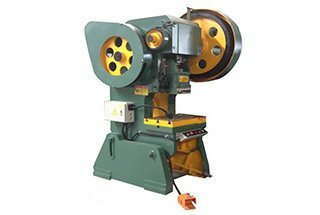 When installing the punch press machine, it should assemble the press machine, anchor bolts, horizontal adjusting plate in the pit. After adjusting the press horizontally, fill the concrete into anchor bolts pit. 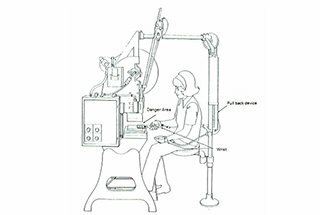 (1) The footplate around the punch press machine should be prepared by customers with proper materials. (2) If need the shockproof, it should add fine sand stone layer about 150mm wide around the foundation. Before adjusting, it must understand the structure of press in detail. Please prepare the foundation according to the foundation plan. If the soil is soft, please strengthen and iron reinforcement properly. When the press entering the factory, put the press in the dry place for several days, checking electromotor and transformer. And then start to install. The punch press is coated with rust preventing oil on the way of transport. It should wipe off the oil before installation. Especially the oil on the surfaces of gibs and friction surfaces must be cleaned. Please measure the levelness of the press with precision leveler. The foundation bolts will be fixed only when the level meets the requirement. If users choose to install bolster by themselves, it should notice to keep interface between bolster and working table clean. Don’t leave paper, metal scrap, gauge, washer, dirt between bolster and working table. Unpack the package and check whether accessories are damaged. Clean motor, belt pulley, flywheel groove, and bracket. Don’t make liquor drop into the electromotor. It must clean V belt with cloth but not cleaning liquid. Install the motor to the joint position, but don’t lock screws completely. It should notice to support the weight of motor with the sling before locking screws. 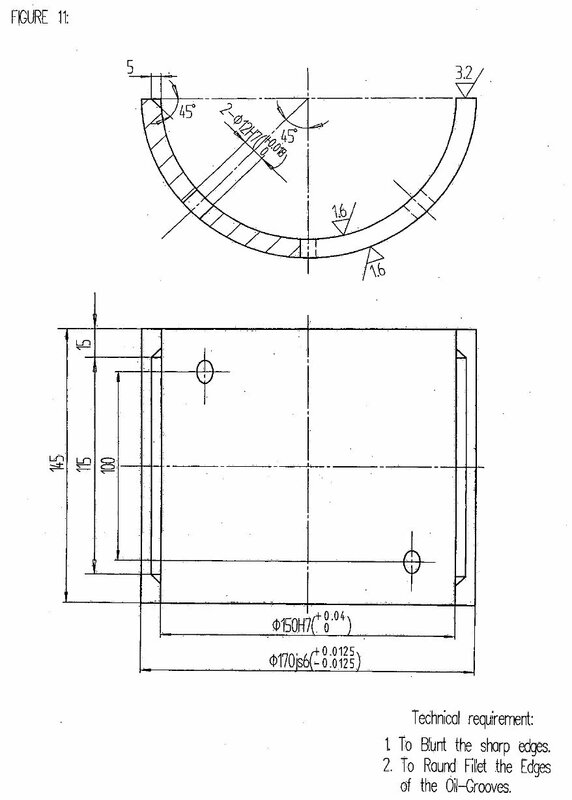 Measure the reference-line of belt pulley groove and flywheel groove, and move the motor to the reference-line correctly. If the reference-line belt pulley groove and flywheel groove is not matched, it will damage to belt groove and bearing of the motor. If the reference-line of belt pulley groove and flywheel groove is not matched, it will damage to belt groove and bearing of motor. After adjusting the reference-line, tighten the screws of the bracket of motor. Move the motor to the flywheel and don’t make V belt building up strains when V belt sliding in the block. Don’t force the belt to enter into the groove. After installation, the tension belt should be about 10mm when pressing it with the thumb. Levelness of bolster is very important. Most of the presses are installed with bolster. But before measuring, it must check whether the screws are locked. Place a precision level gauge on the bolster for the front, middle and back measuring. Shims may be used to adjust the levelness frame. ① The shims must be as large as the foot of press which could make the foot interface bear weight evenly. ② It must check up the levelness one month later. If the error appears, readjust the levelness. Check others items once every half year and assure the levelness of press, which could maintain good performance of the press. are 0.6MPa. 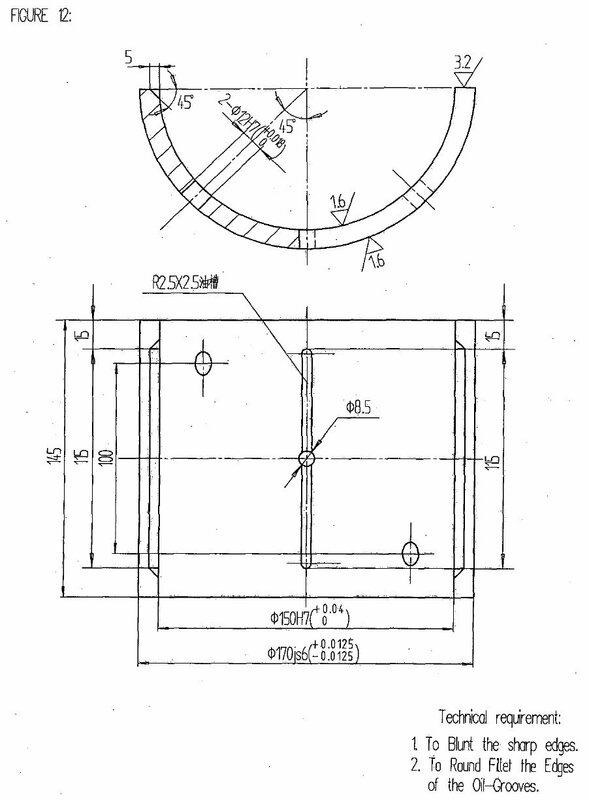 But the distance from the air source to press should be within 5 meters, and the diameter of the pipeline cannot be less than1 “. The dust and sewage should be cleaned from the channel. After installation, it should check the precision according to the certificate. On the way of transport, jounce and vibration maybe affect precision. It needs to adjust the precision of press. 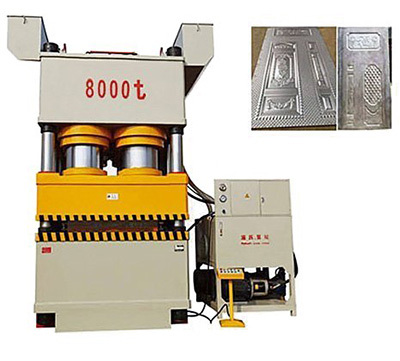 The punch press can be used until precision is OK.
Before starting the press, it should notice to clean greasy filth, especially the surface of gibs and friction during the course of unpacking, then choose proper operation rule according to working requirement and make the necessary preparation of tools. After installation of the die, use inch stroke and move the slide to bottom dead center step by step. Don’t make die meet each other, and adjust the height of die manually. After adjusting the die, it cannot start single and continuous stroke. It should adjust the position of the knockout bar to make parts knockout after slide stroke stopped (near top dead center). But when slide moves to top dead center and knockout bar is pushed to the bottom, it must be noticed don’t make touch the bottom of knockout bar groove for disturbing movement. After adjustment, it adopts inch stroke and finish stroke once step by step. The single and continuous stroke can be done after assuring there is nothing to prevent press working. The air pressure of punch press should be 0.55-0.60MPa, and the maximal pressure of safety valve should be 1MPa. (1) Push the air switch of the main control box to ON and assure the punch press machine is OK.
(2) Close the door of the main control box. Alert: For the safety, it is forbidden to open the door of main control box when operating the press. (1) Push the switch on the operation panel to ON, then the power indicator (AC110V loop) will light. (2) Assure whether “Emergency Stop” button is released. 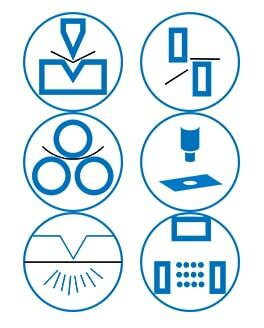 (3) When the pressure is not normal, the indicator will go out and the punch press machine will be on the status of Emergency Stop. Now adjust the air pressure to the proper value. Operate the press until the indicator lights. Press the start button, the main motor will run and the main motor indicator will light. Notice: the main motor will run if the mode switch in “OFF” position. Press the motor stop button, the main motor will stop running, and the indicator will go out. But the main motor will auto-stop if followings appear. The fuse of the loop in the main motor blows out. The thermal relay is in the status of protecting. Power cable specification must be according to requirement. Air leak in the clutch cylinder and rotator joint is forbidden. Press the switch to ON, indicators of power and pressure will light. Turn the mode selection switch to “inch stroke” position. Press and release “two-hand” operation button, check solenoid valve action and assure air releasing, clutch in flexible motion without interference. Press the start button, the main motor will run and the indicator will light. 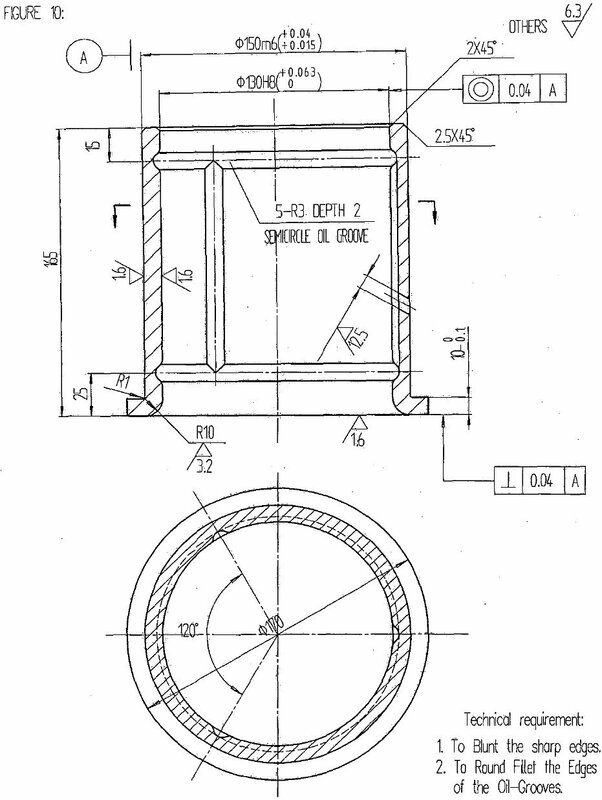 Check the rotation direction of the flywheel that must be same as marked in the press. Check the start and speed acceleration of flywheel. The sliding voice of V belt slip must be normal. The motion should be normal in Single and Continuous Stroke. In Continuous Stroke, press the emergency stop button to assure the clutch separate and the emergency stop button could be locked. In Single Stroke, the press cannot run continuously when pressing the operation button. In Single Stroke, the stopping position should be between +5°and -10°of top dead center. The deviation is forbidden. In Continuous Stroke, press the stop button, the stopping position should be between +5°and -10°of top dead center. The deviation is forbidden. 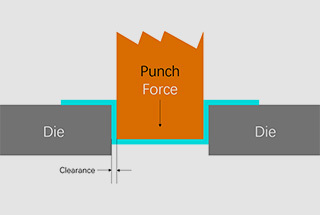 In Continuous Stroke, press emergency stop button, the punch press should stop immediately. Turn the slide adjustment switch to ON, the operation will be forbidden. Adjust the height of die, when the slide moves to upper and lower limit, motor adjusting must be stopped. Check whether the die height indicator is same as real value. Operate strictly according to manual and safety procedure. It should joint the clutch after the motor starts then runs in full speed. Maintain good equipment earth connection and often check it. When the operator leaves the press, cut off the power. The working load of the press should be in the range of the safe graph. Don’t run the punch press when the safety device is disassembled. It’s absolutely forbidden to punch two pieces of sheet. If the slide falls freely or strikes irregularly with noise, stop the punch press immediately and check it. Often check air pipeline. 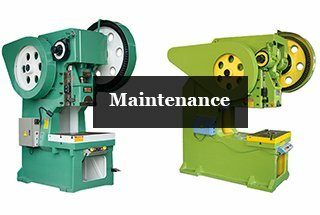 If find air leaks out, repair it before operate the punch press machine. 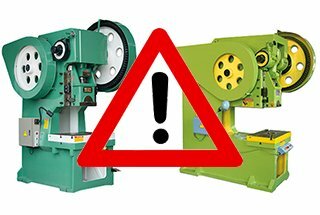 In order to guarantee of personal safety, it is forbidden to put any part of the body enters into the dangerous area of the die. It also forbids working and maintaining in the dangerous area before adopting safety measures. Photoelectric protector is optional. The press has Photoelectric protector connection points. 6. Slide doesn’t move back to normal position emergency stop 6. Operate with inch stroke and adjust the position of slide. In the course of operation The press doesn’t run 1. Error in solenoid valve 1. Check the solenoid valve or replace the loop of the solenoid valve. Noise in the slide 1. Ball shape cover board loose 1. tighten the bolts. The clutch doesn’t work when pressing two-hand buttons simultaneously. 1. Air pressure is low 1.Check air source or adjusts regulator. 2. Wrong position of the proximity switch. 2. Adjust cam switch.